My journey in neuroscience and nutrition led me to look for an easier way to improve health and the idea of Love Bottle was born. Love Bottle is a beautiful, elegant, reusable bottle that is all about bringing Love and Water together and Drinking with Love. The bottle was created to help the physical and emotional health of our bodies, our communities and our planet. Our bodies and our planet are both around 70% water. It is the main ingredient of who we are, and part of every cell in our body. When we bring Love into our water drinking experience, it can be powerful. We take 40-60 sips of water every day. Each sip is an opportunity to change the way we feel and to remember the things that are most important to us. Our Love Bottle is a friend and a reminder to wear our hearts out, to Stand for Love and to remember that at our core we are all LOVE. From the way we manufacture our bottle, to the way we work as a team, to the way we appreciate our customers, we stand for LOVE. We believe that as a company we have the ability to affect change and the responsibility to make that change for the betterment of our community and planet. Collectively we can have an incredible impact when we stand together, and that is what the B Corp Community is doing in this world. We are proud and honored to be part of the movement that B Corps are creating. Learn how you can be part of the change at bcorporation.net. We are proud to support over five USA manufacturers, most of them small family businesses to create a 100% USA sourced and manufactured Love Bottle! Our glass is made by Owens-Illinois in the small town of Crenshaw, PA where most of the people have jobs at the glass company. Our ceramic lids are handcrafted by artisans in the Chicago area. They require almost 100 touches and the people who make them affectionately call them their "babies." Our food grade silicone seal and stainless steel wire are also manufactured in the Chicago area. The expert engineering our of our partners ensures that your lid will never leak! Our decoration printer in Toledo, OH is the best to work with! We use a non-leaded ceramic ink that passes all regulations for safety. It is completely scratch resistant and dishwasher safe. Our designs artists hail from all over the country with a core from our hometown of Portland, OR. Every bottle has been created to provide you with an amazing drinking experience that you can feel good about. Thank you for supporting USA Made and our Love Bottle team. Love is contagious. Studies have shown that showing care, compassion and empathy can inspire those feelings in others. Feelings of love have been linked to reduced stress, long life and improved mental well-being. 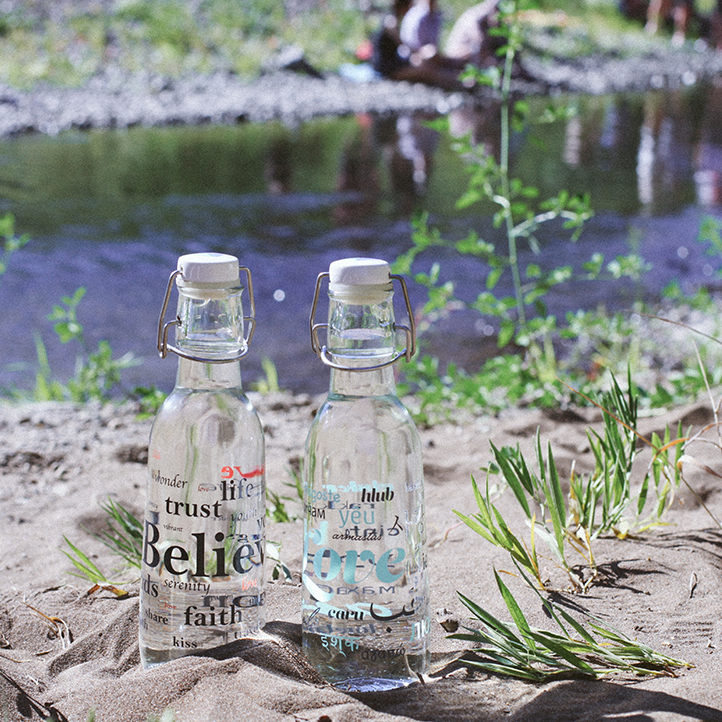 Love Bottle is about bringing Love and Water together and every bottle has love messages embedded. Our handcrafted lid has two water droplets coming together to form the heart. There is a raised heart on the chest to remind you to always wear your heart out and a special discovery message on the bottom. When you take a sip, look through the mouth of your bottle and you will see that UR Loved. Water always tastes better when you Drink with Love! Drinking From Glass Tastes Better, Try It! Everything tastes better in glass, especially water! Try a taste test at home to compare. Unlike plastic, glass has no harmful chemicals that can leach into your water and into the environment. Unlike steel and aluminum, there is no residual metallic taste in your water! Glass is made of all natural materials. There are no toxic elements and it is easy to see when your Love Bottle needs a cleaning. Using glass feels good! Love Bottle was designed by glass experts so the drinking experience and mouth feel is perfect! At Love Bottle, we are on a life mission to reduce the use of single use plastic. The US is the largest consumer of plastic water bottles in the world. Plastic is a substance that cannot be broken down. So even if the bottles are recycled, they are considered to be down-cycled. That means they are broken down and then reused if possible into a lower-value product. Every year we use 17 billion barrels of oil to make plastic water bottles. This is enough fuel to power 1 million cars! Reusing a water bottle can save you money (bottled water is 10,000 times the cost of tap water), and it can prevent the use of more than 240 plastic water bottles per year. We know for the benefit of our planet and our health, actions and choices matter. Choosing and using a Love Bottle is making a positive choice for change!